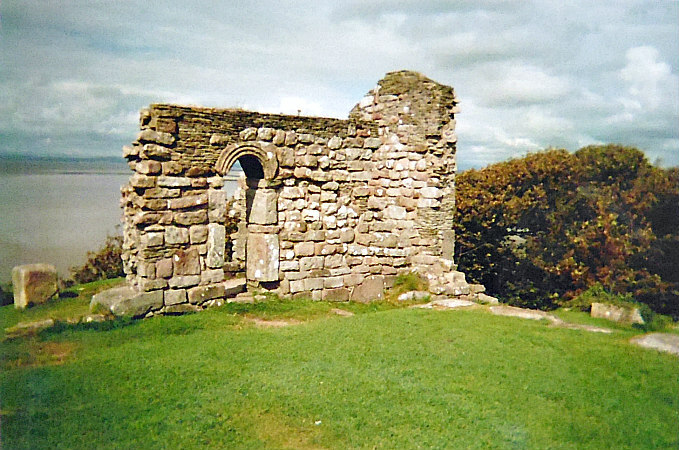 St Patrick’s Chapel on Chapel Hill, Heysham. OS Grid Reference: SD 40980 61628. On the headland above St Peter’s parish church at Heysham, in Lancashire, stand the ancient ruins of St Patrick’s Chapel, a Saxon building dating from either the 8th or 10th century AD. 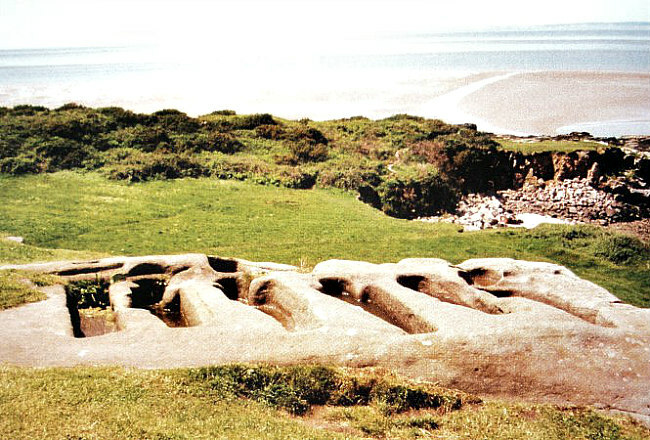 Also upon Chapel Hill, overlooking Heysham Sands, and just opposite the ruined chapel there are two sets of rock-hewn graves that are said to date from the 11th century AD. 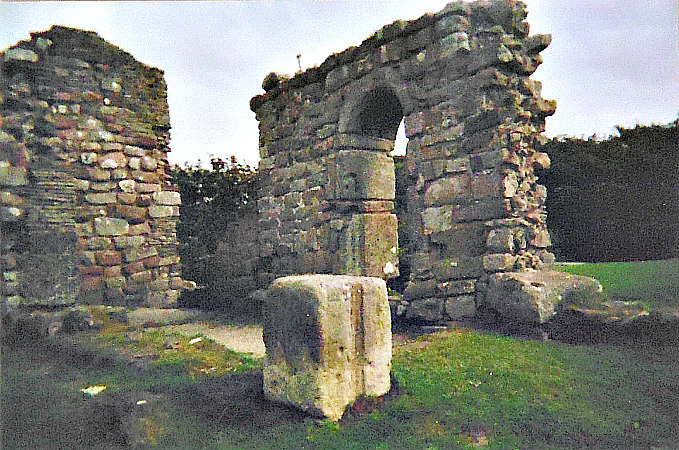 It is thought to be very unlikely that Ireland’s patron saint ever set foot on Heysham Head, as much as that makes for a very good story, although beneath the ruined chapel’s stonework there are the foundations of an earlier Celtic-style chapel – maybe dating back to the 6th century AD. To reach St Patrick’s Chapel: from Main Street take the rough track that heads west past St Peter’s churchyard entrance, and then slightly up hill for a while, then take the footpath that veers off the rough track for a few metres up to Chapel Hill and the ruined chapel with the curious rock-cut graves close by. St Patrick’s Chapel, Heysham, from a different angle. The chapel measures 27 feet by 6 feet and is built from large, rough-hewn lumps of sandstone, with thinner rubble coursework sections between and at the top, but the curved Saxon doorway is by far the best part of the structure. According to Richard Peace (1997) the sandstone blocks that make up the chapel are: “fused together by molten shells.” However, a large part of the chapel has now gone through robbery of the stonework, or it has been used elsewhere in the vicinity, or maybe just lost to time. But beneath the ruin there are the foundations of an earlier Celtic-style chapel of the 5th or 6th century AD. It had been thought that the little building dated back to c750 AD, but in reality it probably dates from the 10th century AD, which would make it “contemporary with the earliest part of St Peter’s Church”, according to Eileen J. Dent (2003). Author Eileen J. Dent says that: “In 1977-8 archaeologists found decorated plaster among the foundations of the earlier building. From discoveries, it would seem that the chapel was used only for worship and burial, and never used as a place of habitation. For example it could not have been a hermitage. There is no registration of the chapel as a chantry. “The chapel and the ground to the south were used as burial places. Some skeletons were found within the chapel and many more in the ground outside. The soil level is very shallow, and although the skeletons were in layers, none was buried deep. Opposite St Patrick’s Chapel are six rock-hewn graves that are carved out of a large flat sandstone rock. Two of these are straight-sided and four body-shaped, each having a hole at the top, which might have been for a wooden cross. Close by there are another set of two graves but these look to be of a later, Medieval date, maybe from the 13th century? The set of six graves are thought to date from the 9th-11th centuries AD, but more likely to be of the latter century, which would make them Viking in origin. The question must be then, were the priests that served St Patrick’s chapel buried in these graves? That we don’t know but I would think they probably were. Today the rock graves are often filled with rainwater. The graves are Grade II listed and a Scheduled Ancient Monument. Illustration of the Hog-back tombstone in St Peter’s, Heysham. Below Chapel Hill stands the ancient parish church of St Peter parts of which date back to the Saxon period. Beside the pathway to the church there is the stump of an Anglo Saxon cross-shaft, which might be of the 9th century AD. It stands at just over 2½ feet high and is in the form of a house with windows and a door carved onto it – with faces and figures looking out. There is perhaps an association here with the visit of the three Marys to the sepulcher, or the raising of Lazarus, according to Nigel & Mary Kerr (1982). The upper three windows have faces looking out and a shrouded figure in the doorway below. There is also a round-headed panel (west face) with a saint holding a book, and below that and on the sides are foliage scrolls, say Nigel & Mary Kerr. Housed within the church (south aisle) is a hog-back tombstone of the 10th or 11th century AD. This used to stand out in the graveyard but was brought into the church (1961). It is richly decorated with scenes of stag-hunting from the Norse Legend of Sigurd. There is also zigzag carving, and at either end strange creatures cling to the stone, but whether they are hogs or bears is open to question. Almost certainly it was the gravestone of a wealthy Viking warrior. Dent, Eileen, J., Heysham – a History, The Rector & Parochial Church Council of St Peter’s Church, Heysham, & Heysham Heritage Association, 2003. Kerr, Nigel & Mary, A Guide To Anglo Saxon Sites, Paladin (Granada Publishing Limited), St Albans, Herts, 1982. Pevsner, Nikolaus, The Buildings of England – North Lancashire, Penguin Books Ltd., Harmondsworth, Middlesex, 1979. Categories: Ancient Churches / Chapels, Ancient Crosses, Rock-Cut Tomb | Tags: St Patrick's Chapel And Rock Graves at Heysham in Lancashire | Permalink.